Thirty-one countries across the world are now in debt crisis, with a further 82 at risk, according to new figures released by the Jubilee Debt Campaign on 16 May. The figures are being released on the 20th anniversary of the G8 meeting in Birmingham (UK) 1998, when 70,000 people formed a human chain around the summit and called for unpayable developing country debt to be cancelled. The new figures, calculated by the Jubilee Debt Campaign, classify countries as in debt crisis if they have a large financial imbalance with the rest of the world and high government payments on external debt as a proportion of revenue. Countries in the global South which have been in debt crisis for many years, having never qualified for previous debt relief schemes, including Jamaica, Pakistan, Sri Lanka and Tunisia. “The global Jubilee movement successfully won $130 billion of debt cancellation for some of the most impoverished countries, leading to increased spending on health and education. However, there was insufficient action to prevent future crises and now we are seeing a worrying spread of new crises across the world. We urgently need more responsible lending and borrowing, and mechanisms to ensure reckless lenders pay their share of the costs of crises when they occur. The analysis also concludes that 47 countries are at risk of a public debt crisis and 62 countries are at risk of a private debt crisis. Some countries are included in both these groups, such as Argentina, Egypt and the United States. 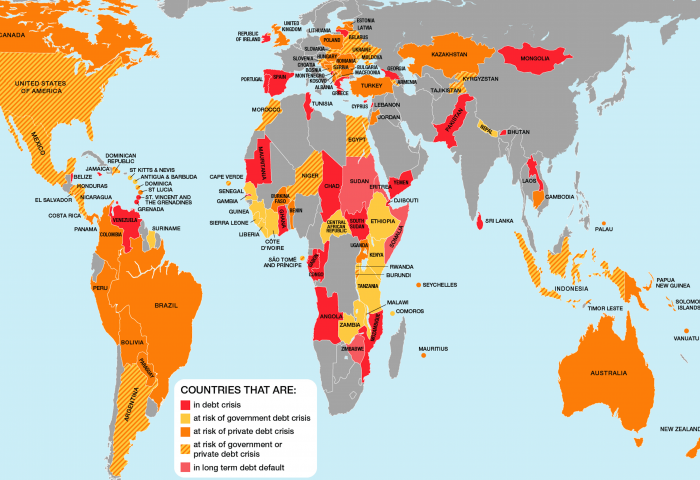 In total, 82 countries are at risk of either a public or private debt crisis, or both. Countries at risk of a private sector debt crisis include Australia, Brazil and the UK, and those at risk of a public debt crisis include Ethiopia, Senegal and Zambia. The analysis of risk of either a public or private sector debt crisis is based on a country having a significant financial imbalance with the rest of the world, and either a significant government debt or debt payments, or significant private sector debt, compared to the country or government’s capacity to repay. In March 2018 Jubilee Debt Campaign released figures which show that developing country debt payments have increased 60% in three years, and are now at their highest level since 2004. The IMF and World Bank only conduct comprehensive debt sustainability assessments for 67 of the most impoverished countries in the world. Of the countries they assess 30 are in debt distress or high risk of being so, up from 15 in 2013. In contrast, just 10 are at low risk, down from 24 in 2013. The full figures behind the analysis are available here.